E very Day is for the Thief is a curious book: the blurb says that it’s a novel but it reads nothing like a novel, more like a travel memoir, and a rather melancholy memoir at that. Cole’s narrator is an expat Nigerian who goes ‘home’ after an absence of fifteen years. The book consists of vignettes of Nigerian life, invariably depressing ones recording his dismay at the lamentable state of affairs there. It is hard to escape the conclusion that the nostalgia that drove him home was very quickly replaced by a judgemental eye. Like many a first novel, Every Day is for the Thief betrays the urge to get something off one’s chest, in this case the author’s disappointment with his own origins. I’ve read a number of Nigerian novels, and none of them shy away from the problem of poor governance, crime and endemic corruption. But Cole’s novel goes into overdrive: as the narrator goes in search of his identity successive chapters expose the routine bribery; the standover men; ‘area boys’ who (unarmed) turn up and intimidate grown men into handing over money; home invasions; the necklacing of a boy who kidnapped a baby for a gang; the unabashed scammers in internet cafés; the police who pull him over and demand ‘something’; and so on. In an interview at the Africa Book Club Cole says that he is not interested in African optimism, he is interested in African realism. But realism is necessarily selective, and for all that this is a story of homecoming – to family, old friends, a first love – the relentless negativity conveys a sense of the narrator as a hyper-critical outsider. The writing is excellent – the vignettes are vivid, and the depiction of the narrator’s melancholy soul coming to terms with the gulf between nostalgia and reality, is compelling. Maybe this is what Salman Rushdie admires. But the pessimism of this purported novel of middle-class disenchantment depressed me in a way that the Song for Night or Waiting for an Angel did not, despite their horrific subject matter. Other reviews are at the New York Times and the Guardian. Hmmm, actually, Jane, I’d really like to know what you might think of it…. sigh. ok it stays on then…:) i got a copy for a couple of bucks and it’s just sitting on my pile taunting me. Oh good, do pick it up and start it. I couldn’t sleep last night so I started it at about midnight – and it took no time at all to read. OK, I have done as you requested (you’re right, only took a day to read). I’m interested in this ‘genre’, if it is one, of novellists writing a character very much like themselves doing everyday stuff they could plausibly have done but calling it fiction (see also WG Sebald and Tao Lin). I am unashamedly putting Sebald on a pedestal way above Cole and Lin, but I still think it’s an interesting approach to pursue. So, my feeling from reading this and ‘Open City’ is that Teju Cole wants to create a ‘Teju Cole’ who is much less emotionally involved than he is (and perhaps even a bit of a psychopath, based on Open City), and walk him through the real Teju Cole’s life and see what happens. I can’t say I like it – it’s so deliberately distancing that it’s hard to get at all involved – but I do appreciate it. And I do like vignettes as a way of building up an impression of a place. But overall it comes off pretty pompous – the scenes where he feels maybe Nigeria is OK after all because someone’s reading Ondaatje and someone else likes jazz, and particularly finishing the novella with a pensive meditation on the symbolism of death. Pompous. Jane, you’re wonderful. I never connected it with Sebald at all (I’ve never read Tao Lin) but of course you are right. There’s another P word we could use: patronising! Speaking of ‘p words’ i seem to have misspelled pedestal… I don’t reckon you’d like Tao Lin much, Lisa. Why wouldn’t I like Tao Lin? What kind of writing is it? he writes stories about a guy called Tao Lin who takes loads of drugs and is distant and kind of mean and difficult and wanders around thinking about stuff and feeling depressed. Oh dear…I loved Teju Cole’s Open City, but something has been stopping me from reading this one. I think I’ll wait for his next book instead. Thanks for the review. Hmm, I’ve been meaning to read Cole but maybe I’ll read Open City and not bother with this one. Oh Jane, I don’t know if you meant to – but you make it sound hilarious! 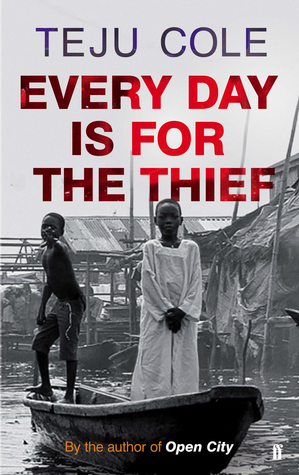 Hi Lisa, just finished reading Everyday is for the Thief, and agree it reads like a memoir. Most memoirs are interesting reads, but you do question the validity of some of the memories. However, I don’t doubt what Cole says about Nigeria and its corruption. With so many people, so many different tribes, religion differences and cultures (especially now that the Chinese have moved in to be involved in the commercial side of things), you can understand how many difficulties would arise. I liked the writing style; Cole is very easy to read. I don’t know if he is being pompous, I just think he has been a lucky person who has been introduced to other music and literature styles. I will try to get a copy of his Open City. Um, actually I don’t think I have questioned the validity of his memories. LOL to use another P word, I think it’s all entirely plausible. I don’t doubt that those things happen either, and they could conceivably happen all to one person, though probably like most authors he’s harvested the experiences of the many to create one.